Preparation Using a clean bowl and feeding spoon... Mix 1 spoonful of cereal with... 2 spoonfuls of warm, previously boiled water and stir. If serving warm, check temperature before feeding. As your baby's appetite grows, use a larger spoon to make a bigger serving. This is only a guide, if you want to alter the consistency, add more or less water as required. Breastfeeding is recommended for the first 6 months of life. Please speak with a healthcare professional before introducing solid foods. 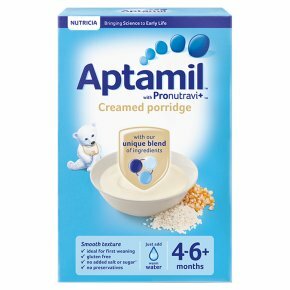 Serving suggestion Smooth textures are best when your baby starts weaning because they're easy for your baby to manage. Why not add your baby's favourite fruit purée for a great taste and the ideal texture? Important<br>Do not leave your baby alone whilst feeding.<br>Remember to clean your baby's teeth, especially before bedtime.